What Hall voltage is produced by a 0.200-T field applied across a 2.60-cm-diameter aorta when blood velocity is 60.0 cm/s? This is College Physics Answers with Shaun Dychko. We want to find the Hall Effect voltage across a 2.6 centimeter diameter aorta which is a blood vessel and given that the blood is traveling at 60 centimeters per second. 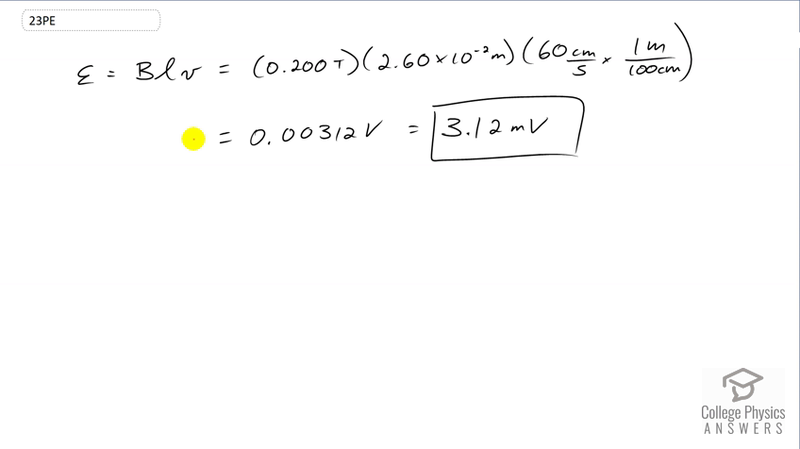 So we have this formula for the Hall Effect voltage, magnetic field strength times the size of the metal strip or the size of the diameter of the tube that we're dealing with times the speed of the charge carriers that are flowing through it. So in this case we have 0.2 Tesla magnetic field strength and the diameter of the arteries aorta is 2.6 times ten to the minus two meters times by 60 centimeters per second which we have to convert into meters per second by multiplying by one meter for every 100 centimeters. And we end up with 3.12 milli Volts will be the Hall Effect voltage.